Surds : which are square root and it cannot be simplified into rational numbers. But indices can be simplified. 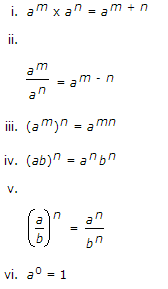 For Example: (3 / 9)(1/2) can be written as 1/ but cannot be written in the form of fraction. 1. All surds are irrational numbers. 2. All irrational numbers are not surds. Then, is called a surd of order n.
2) Surd can be simplified if factor of x is a perfect square.